The BCHS School Handbook contains important information for students and parents, including our expectations, policies and procedures. We immerse students in a diverse and engaging learning environment. We strive to inspire the passion for discovery, the confidence to embrace challenges, and the skills to pursue success. Students, parents and school authorities have moral, ethical and legal responsibilities for ensuring welcoming, caring, respectful and safe learning environments that respect diversity and nurture a sense of belonging and a positive sense of self. In these ways you will do your part to ensure that your school is a respectful, safe and healthy place. 2. Be polite and use appropriate language and gestures. In these ways you will be showing people that they are welcome in our school. 3. Be honest and correct your mistakes. In these ways you will be acting as a caring and responsible citizen. 4. Come to school prepared to learn and do your best. In these ways you will guarantee your best possible results. 5. Be proud of your school. In these ways you will be doing your part to make your school the best that it can be. Student regulations are designed to ensure orderly conduct in and around school, to protect school property, to ensure student safety, to protect individual rights and also to adhere to the Board of Education policies and government (provincial and federal) laws. We are also expected to ensure that students not only learn rules of proper behavior, but also practice them. I have a right to an education. It is my responsibility to do my best, listen, to learn, to practice, to complete school assignments and to graciously accept remedial assistance when necessary. I will respect the rights of others to learn by not disrupting or interfering with the instruction of my teachers or the learning of classmates. I have a right to feel safe and welcome, and to be treated with dignity and respect. It is my responsibility to treat others with honor and consideration. I will not laugh at, tease or put down other students, staff or adults. I have the right to hear and be heard. It is my responsibility to help maintain a calm, peaceful and quiet school. I will not interrupt, shout or make loud noises when others are speaking. I have a right to be safe and secure. It is my responsibility not to threaten or hurt the feelings of others. I have a right to free expression in learning about myself and others. It is my responsibility to learn about others and myself. I am free to express my feelings and opinions as long as I am not disrespectful, rude, or violating the order of the school or personal and public property. I have a right to be myself in this school. It is my responsibility to respect others as individuals and not to treat them unfairly. I have a right to privacy and to my own personal space. It is my responsibility to respect the personal property of others, and to accept their right to privacy. I can expect that all these rights will be mine as long as I am exercising all my responsibilities. Gross misconduct, willful disobedience or flagrant disrespect will result in immediate discipline that may include suspension from school. Violation of the following regulations will result in suspension. Students under suspension will not be allowed to attend or participate in any school-sponsored activities. The use or possession of drugs or liquor on the school premises or being found under the influence of alcohol or drugs is strictly prohibited. Smoking or chewing tobacco on school premises (school yard and building) is prohibited. Students exposing cigarettes or cigarette packages may have them confiscated. Boys and girls are expected to conduct themselves appropriately. Arms around each other, holding hands, hugging or kissing is not acceptable in the school. Students are requested to respect school property. Students who cause willful damage to school property will be disciplined and assessed repair costs. Students will not be called from class to answer the telephone except in emergencies. Messages may be left at the office. Students are requested to refrain from littering, and could be asked to clear and clean areas they have used. Students are to refrain from loitering in hallways or bathrooms. Eating in the gym, including the stage area, is not allowed. In general, Barrhead Elementary School is out of bounds to all Barrhead Composite High School students, except where access is required by class activities. Please note that lockers are the property of the school division and are subject to search or repossession if a students is suspected to be of possession of unauthorized, illegal, stolen substances or items. Students not following the rules or not fulfilling their responsibilities, as a student and citizen of the school, may be removed from activities as determined by the principal. Harassment can consist of a single incident or several incidents over a period of time. Harassment will be considered to have taken place if a reasonable person ought to have known that the behavior was unwelcome. Don’t ignore harassment. Report it to the principal. Every student attending BCHS must dress appropriately and respectfully for a learning/work environment. Students may not wear clothing that displays offensive material such as; Profanity, Obscene Gestures, Discrimination, Sexual Reference, Anti-social Values, or Promotion of Alcohol or Drugs. It is important for students to be comfortable; however, clothing must cover the torso appropriately regardless of gender or activity. Transparent clothing is not acceptable and underwear should not be shown. Teachers and administrators are responsible for carrying out this policy at school. Students may be asked to reverse, cover or change clothing or may be sent home to change if necessary. Parents may also be notified of inappropriate dress. Parents are responsible for monitoring what their children are wearing to school, ensuring that it is appropriate and providing alternate clothing when requested by the school. Students and adults are prohibited from smoking within any Pembina Hills Public Schools No. 7 buildings and on any Pembina Hills Public Schools No. 7 grounds. The use of chewing tobacco is NOT permitted on school grounds. The Transportation Department wishes to ensure that all students enjoy a safe and trouble free ride. All students are expected to behave in a reasonable and responsible manner, and will follow the driver’s directions while the bus is enroute. Students are responsible by law to the driver and the principal for their behavior. REMEMBER: School bus transportation is a privilege – not a right. Please treat it that way. When possible, please advise your bus driver when students will not be on the bus. Students remain quietly in their assigned seats. Arms, legs, head and/or other objects are to be kept inside the bus. Playing of radios, tape recorders, etc. is prohibited, however, students may use headphones at reasonable volume levels. Students are expected to respect property and the dignity and space of others. Disruptive behavior causes driver distraction and creates a safety hazard. As provincially legislated, children between the ages of 6 years (at September 1) and 16 are required to attend school. 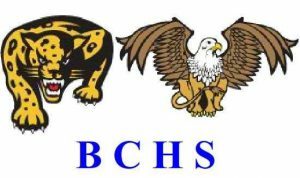 Additionally, students over 16 registered at BCHS are expected to attend school. Generally, students are free to leave during the noon break. Regular class attendance is a highly significant factor in student achievement. Significant absences are likely to have a detrimental effect on the student’s success. For this reason, BCHS strongly encourages students to attend school regularly. Students may be granted permission by the school administration to leave school for appointments outside the school, provided the school receives a note or phone call from a parent or guardian explaining the need and reason for such an absence. The validity of the reason given and whether the student is granted permission to leave will be at the discretion of the school administration. Examples of valid reasons would be to write a driver’s exam, or for attending a medical or dental appointment. It is anticipated that requests to leave school will be kept to a minimum. Students who are truant or excessively absent from school will also be subject to discipline as outlined by the school division procedure. Students are expected to be in class on time on a daily basis including Extended Learning Time* (see page 15). Repeated refusal to comply with this policy may result in disciplinary action that may include withdrawal from courses or school, a failing mark assigned, and/ or suspension. The responsibility for regular attendance rests with the student and the student’s parents/guardians. Student absences that occur without any notification may result in the recording of an unexcused absence. The school will inform parents if regular attendance is not occurring. Parents/Guardians have the responsibility to notify the school in advance of any absences to ensure consideration is given to any upcoming assignments or exams. Students who are absent for exams and assignments are responsible for contacting their teacher (s) on the first day back and for making arrangements to complete work missed. The classroom teacher will discuss attendance expectations with their students at the beginning of each semester. Teachers will record all absences for every class on the attendance form. Absences will be recorded in the office. To insure the best educational experience when using a computer and accessing the Internet, the following practices and guidelines which comply with the Pembina Hills Computer Use Policy, will be followed by the staff and students of Barrhead Composite High School. Computer and Internet users will review or download only information, computer software, or images that are classroom related, have educational value and are consistent with division educational goals. No games may be downloaded. Be polite. General school rules and policies for behavior and communication apply as they do in the classroom or hallway. Do not send abusive messages to others. Do not reveal your personal address or the phone number of students or colleagues. Do not use the computer or network in any way that would disrupt the use of the network by other users. All communication and information accessible via the network should be assumed to be private property. Handle the computer equipment with care and respect. Attempt to tamper with other people’s data or to gain unauthorized access to data on the Internet, the File Server, or the Hard Drive. Reconfigure or change setups in any computer system. Barrhead Composite High School reserves the right to inspect and review computer files if it has reasonable cause to suspect that a student or employee is using the computer for illicit or illegal purposes, or for purposes in violation of the policy. The school authorities may conduct such inspection when deemed necessary, without notice, without consent, and without a search warrant. Students and a Parent/Guardian must sign a consent form for computer use and Internet access. The student(s)’ immediate needs are attended to by qualified school staff. A parent/guardian will be contacted; upon approval of the parent, the student will be sent home. If a parent/guardian cannot be reached, the student will be made as comfortable as possible at school. If injury or illness appears serious, student will be transported to the hospital emergency department. The school cafeteria serves all students and staff. It is open from 8:00 a.m. to 2:00 p.m. Students are expected to clean up after themselves. Garbage is to be placed in garbage cans. Students are also responsible for cleaning any area where they use within the cafeteria. 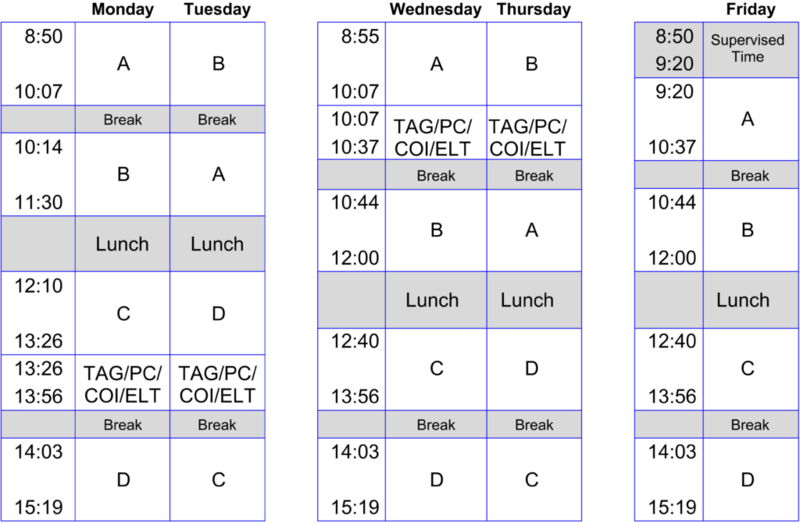 Students utilizing cafeteria services are still accountable to class start times. Fire Drill, Shelter-In-Place, and Lockdown procedures are posted in each classroom. Students are required to become familiar with these procedures. The school will complete practices of these procedures during the year. Research shows that when staff work together in Professional Learning Communities (PLC), there is a direct correlation in improved teaching practices and improved student learning. In an effort to keep teachers in the classroom, the board has set aside six early dismissal days to accommodate PLC meetings without disrupting the classroom. See the calendar for the dates. Comprehensive intramural and extracurricular sports programs are offered. Some programs are offered at no-cost, while others will cost to participate. During noon hours, students have the opportunity to compete in various sports. Noon hour leagues have been designed to maximize participation. The school competes with many other schools in such sports as basketball and volleyball where the activities take place outside of regular school hours. We offer a wide variety of things to do at noon, afterschool and on weekends. The list below are some of the activities we have offered when volunteer coaches are available. Extracurricular school teams represent our school in many sports, and participation in such is regarded as a privilege. Interested students should check with their physical education teachers for specific information. The Barrhead Composite High School library is fully computerized and is networked to other libraries via the Yellowhead library services. The library can access the holdings of other libraries and the media center. Students are encouraged to use library materials and services for class work and their own enjoyment. Library materials include reference works, vertical files, fiction and non-fiction books, magazines, CDs, videos, maps and career information. Library services include assistance in locating materials and doing research. Please ask for assistance if required. Students using the library are requested to be prompt in the return of borrowed books and to adhere to library regulations. Continued negligence in return of books and in the payment of fines may result in the suspension of library privileges. All materials are due back prior to summer vacation. Should a student fail to return the borrowed books, replacement cost will be charged. Each student is assigned a locker and a lock for his/her use during the year. Lockers should be locked at all times. We have extensive community use of the school on evenings and weekends and cannot guarantee the security of student belongings. The school is not responsible for articles missing from lockers. Students may not exchange lockers without office staff approval. As the locker is the property of the school division, the school reserves the right to search and/ or repossess locker(s) in cases of emergency and disciplinary investigations without notice. While there are no “Textbook Rental” fees in the coming school year, there are occasional fees associated with activities such as field trips are due and payable at the time of registration. In any case, it is the student’s responsibility to care for and return all school materials at the end of the term or upon leaving the school. Students are liable and shall pay for any lost/damaged materials. Student parking is a privilege on school property, and permitted west and north of the school in designated areas. Staff and visitor parking is permitted in front of the school in the designated parking area. Vehicles violating these restrictions may have privileges suspended and risk being towed away at the owner’s expense. People who park vehicles blocking a fire lane are parked illegally and are subject to towing at owner’s expense. Scheduled Parent-Teacher Interviews are formally held twice a year. These conferences involving the teacher, parent, and student are productive in assisting student progress. Parents may arrange an interview at any time during the school year by contacting the office. The use of personal cell phones and electronic devices is increasing in school. Inappropriate use of text messaging and disruptions to instructional time have necessitated that cell phone usage be restricted to non-instructional areas and times. Cell phones and other electronic devices should be turned off and not visible during class time. However, individual teachers may allow the use of personal cell phones and electronic devices in their individual programs and classrooms. Violations of the electronic device/cell phone policy will result in the confiscation of the device/phone and its return at the discretion of the teachers or administration by no later than 3:30 p.m. on the day it is confiscated in the first offence. Upon the second violation, the device/phone will need to be picked up by a parent of the child owning the device/phone. It is our hope that students will show control so that we will not need to be more restrictive. Because our student information system is internet based, it is possible to view your child’s attendance and performance record in the comfort of your own home on a regular basis. For more information, please contact the school office and ask for personalized password to access your child’s information. Students and parents are encouraged to enroll in PowerSchool’s regular communication process to stay informed of progress or changes. School guidance is available to assist students with educational, vocational, career and personal issues. Students may drop in but extended support are requested to make an appointment. The services of school psychologists are available on a limited basis to test and counsel students. Appointments are to be arranged through the student services department. In the office is a free phone with restricted access to all numbers toll free in Barrhead. Students may access office phones for emergency situations. The Superintendent is responsible for the decision to close schools. Major radio stations and principals will be contacted for dissemination of the news. If school buses do not operate, schools will still remain open. Becoming an active member of the Students’ Council or the Sprit Group is an effective way to learn the basic philosophy of participation in a democratic form of government. The main purpose is the promotion of student activities. Other aims include assistance in solving school problems, development of harmonious relations between students and staff members, and the development of habits of good citizenship. Throughout the school year the different Leadership Teams coordinate all extracurricular clubs, dances, class competitions, special days, theme activities, student assemblies and other special events. It is the umbrella organization for all school clubs. The Students’ Councils actively support charities at the international, national and local levels. Students are encouraged to become involved and participate in these activities. Visitors are required to report to the General Office to receive permission to be in the school. Persons unlawfully on the premises may be charged with trespassing under the Alberta School Act. Payments for damage to school property or loss of school property will be the responsibility of the student, based on replacement cost. Fridays from 8:00am-9:30am will be treated similar to how we treat 8:00am-8:55am on Monday-Thursday, in that the school doors are open, and staff are observant of what is going on in the school. The differences are that during Supervised Staff Collaborative time, some staff will not be available to meet with students or parents, as they will be collaborating with other staff, and the hallways will be actively supervised by the remaining staff. Students are expected to manage their time so that they will make it to their first class at or before 9:30am on Fridays. Surveillance cameras have been installed in the school. They are for the protection and safety of staff, students and the property. The cameras function 24 hours a day, 7 days a week. Teacher Advisory Program at BCHS is aimed at providing another adult resource in schools to enrich the overall student experience. Through advocacy, mentorship, and academic monitoring, Advisors will coach students through issues and concerns that may impede success. Students will be advised of their Teacher Advisor at the beginning of the year. Buses will be made available for school activities where possible under the present policy. Transportation fees will be assessed based on the nature and length of trip. When school buses are provided for transport to school functions, students shall not ride in private vehicles unless with a parent or another adult with parental and school permission. These subjects take up 1200 of the 1600 minutes of the instructional time per week. The remaining 400 minutes are devoted to elective courses. Alternate programs/courses are available to students in BCHS who, despite putting forth a determined effort, have difficulty experiencing success in the regular program. Please call Student Services for more information. Complementary courses are adapted to the interests of the pupil, the needs of the community and the special abilities of the teachers. Under their present structure, complementary courses are not meant to be remedial. All junior high students will have a chance to choose a Course of Interest (COI). COI would be classes on subjects interesting to students (e.g. theatre makeup or volleyball skills). These classes will be 38 minutes in length and occur daily, Tuesday and Thursday, at the time Grade 9-12 students have Flex. On Monday and Wednesday, grade 7 and 8 students will have Teacher Advisor Group meetings, which will be used to teach students basic skills for how to be successful in a secondary school, or to provide Flex time. Meet with a teacher, or work in a teacher’s classroom to complete work assigned for ELT, get help in a class, or to finish incomplete work. Go to a Homework or Study area and work on homework, or study for tests. Go to an Enrichment area to participate in activities that add to the school day. Students must be prepared to do some schoolwork at home if they are to be successful. Home study should be on a regular basis if it is to be beneficial. It is strongly recommended that students set aside at least one hour each evening for study purposes. Course content and/or units of study. Evaluation procedures with weighting assigned for various facets or required term work and the final examination (unless exempted). Other criteria to be used in evaluation. Students are asked to bring information to their parents’ attention. Progress reports are sent home to parents on a monthly basis. Parents are asked to contact the teacher with any questions regarding student progress and evaluation. A final year-end report card will be issued. Examinations play an important and necessary part in the evaluation of student performance. In view of the importance of examinations, the following policy has been adopted. A student who has missed an examination during the school year, may immediately upon his/her return to school, be granted permission to write the missed examination provided the absence was excusable as defined by the attendance regulation of BCHS. Students with inexcusable absences may be awarded a zero. Teacher(s) may request that a student write a missed examination regardless of the reason for the absence. Due to the importance of final examinations, an examination period has been scheduled at the end of the school year to write such examinations. Final examinations shall be scheduled and administered in Math, Language Arts, Social Studies and Science. However, final examinations may be scheduled and administered in other subjects. Provincial Achievement Tests are administered at BCHS in May and June annually in English, mathematics, science, and social studies. The schedule for 2018 PAT administration is new, and the dates at which test may be administered are within a window of time for both Part A and Part B set by the school superintendent. Students shall be excused from writing final examinations with no penalty if their absence from school is due to: Personal illness of the student (supported by a medical certificate), Serious illness or death of someone in the student’s immediate family (must notify the principal), An Act of God – will be considered on an individual basis by the principal. If a student misses the final examination for any of the above reasons, the mark for his/her year’s work will become the final mark. John Hohol: Presented to a Grade nine student who has achieved academic excellence (highest marks); with a reputation for mature personal relations with both staff and students. Principal’s Awards: Presented to a grade seven and a grade eight student who has achieved academic excellence (highest marks), with a reputation for mature personal relations with both staff and students. Minimum average of 80% using final marks in all subjects with no final mark below 70%. Citizenship Awards: Based on student service and attitude towards school community and learning. Teacher nominated. Merit Awards: Presented to students in each grade who works hard academically, displays a positive attitude and practices citizenship skills. Awards may be presented in the following: Art, Home Ec, Drama, Music, CTS and possibly others. Rookie Athlete – Outstanding grade seven male and female athletes. Stuart Larkins – Outstanding grade eight male athlete. Marge Hawkey – Outstanding grade eight female athlete. 1Ron Pate Memorial Award – Outstanding grade nine male and female athletes. Students are encouraged to meet with the school student services department and the school administration to discuss appropriate course selections and timetabling issues. Evaluation procedures with weighting assigned for varius facets or required term work and the final examination. Students will receive course outlines and evaluation procedures from each of their teachers during the first week of instruction in each semester. Progress Reports will be issued monthly, and student progress is available on PowerSchool for parents and students. Parent-Teacher Interviews will be held in each term. Semester-end Final Exam Schedules are posted well in advance. Students may not reschedule final exams, except in the case of serious illness confirmed by a medical certificate, or extenuating circumstances approved by the principal. Students who miss examinations, quizzes, assignments, etc. due to absences MUST, upon their return, meet with the respective teacher(s) to make alternative arrangements. There will be limited space in respective blocks so early registration is recommended. Occassionally, students will be directed to attend ELT for remedial purposes. Full time students (40 credits in grade 10/11 and 35 credits in grade 12) with a minimum average of 80% using school based marks in all subjects with no final mark below 70%. The selection of courses is a very important decision. It is expected that students will explore all avenues and utilize the school resources before making the decision to drop a course. A course withdrawal form must be completed and handed in to the office after getting approval from the student’s parent, sending teacher and receiving teacher. If a student drops a course after the halfway point in the semester, the course and a mark will remain on the student’s official record. All grade 10 and 11 students must have full timetables. Grade 12 students may have one spare, which is used for academic purposes. Students should not be loitering in the foyer or hallways during class time. The school discourages part time employment in most circumstances. Jobs can interfere with homework completion, add to student fatigue and prevent participation in school activities. According to a study by Employment and Immigration Canada, part time work above 15 hours a week seems to increase the likelihood of a student dropping out of school. School is a full time job. More than one full time job is difficult to manage successfully. With increased use of on-line sources, we are also experiencing an increase in plagiarism. PHRD has an administrative assessment policy which deals with this. The teacher and the school administrative team will deal with each situation independently. Students plagiarizing are subject to discipline. All final exams are compulsory. If a student fails to write a final exam, a grade of 0% will be used for the final exam component of the final grade. Exceptions due to medical problems, or extenuating circumstances will be ruled upon by administration. Exams are scheduled over the last few days of each semester. Students are not required to attend school during this time if they are not writing scheduled exams. Those wishing to study quietly are most welcome to be in the school. The first appeal should be made in writing to the school principal within one week of the time final standings are released to students. The written appeal shall outline the reason(s) for making the request. The school principal shall acknowledge receipt of the appeal and indicate to the student the expected date when a decision with regard to the appeal will be reached. The school principal shall confirm in writing the outcome of the appeal to the student (guardian/parent) and Superintendent. All appeals at the school system level shall be carried out as quickly as possible. Should a student not be satisfied with the outcome of an appeal made to the school principal, the student may request a hearing from an appeal committee. Graduation is held at the end of June. Students will only be placed on the grad list if they are enrolled in the necessary courses and credits to fulfill graduation requirements. If students need correspondence courses to meet these requirements, they are advised to complete these courses in the first semester. Validation statements will be given to the grade 12 students during the first semester. It is their responsibility to ensure that they have the necessary graduation requirements. Students must have all correspondence courses completed and received by Alberta Distance Learning Center by June 1st in order to take part in grad ceremonies. Failure to do so will result in removal of the student’s name from the grad list and he/she will not be allowed to participate in the grad ceremonies. All students must also be passing (50 % or better) all courses required for graduation by June 1st of the second semester. Failure to meet this requirement will result in removal of the student’s name from the grad list and he/she will not be allowed to participate in the grad ceremonies. Additional information is provided in the graduation handbook. The Graduation Council is elected by the grade 12’s. The council is responsible for graduation day activities. The duties include producing a grad book, organizing the ceremonies, and being a liaison between the parent committee (who are responsible for the banquet and social evening) and the grad class. *Please note that students with outstanding financial obligations at the school are required to pay those off before being allowed to participate in the graduation ceremony. Several awards and scholarships are available to the students of Barrhead Composite High School. These are determined by the Awards Committee and staff and are given on Awards Night in the fall of each year. This enables selection to be made on the basis of achievement on final examinations in both semesters. Qualifications for the majority of these awards are based upon future educational plans, financial need and academic achievement. Application forms for Awards and further details may be obtained from the Barrhead Composite High School Student Services and office. The school award night is held in the fall.